Summertime nostalgia is the best. The sights, sounds, and smells of those long, lazy days bring back childhood memories of time spent with family and friends. And where better to enjoy all those things than the rolling greens and waterfront vistas of the Olympia Country and Golf Club. The Club, which started in 1926 on the shores of Budd Inlet, offers a fitness center, both fine and casual dining, wedding and event space, and championship golf course. This summer, members and their guests, can rediscover this hidden gem. Mike Campbell, the Club’s general manager, says things are gearing up for an exciting season. “The location can be secluded, so we want people to know that there is a great private club in Olympia that offers golf, dining, pool, fitness, kids camps, wine nights, and various other social events,” he says. Membership is required to enjoy the facilities. It’s available for individuals and families, for golf or social use. But even if you don’t know a birdie from a bogie, there’s something for everyone all summer long. 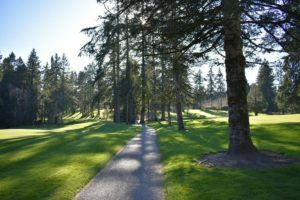 For golfers, the course opens at noon on Mondays, 7:00 a.m. Tuesday through Friday, and 6:00 a.m. on weekends from June through September. The Pro Shop closes at 7:00 p.m., golf cart rentals at 8:00 p.m., and the gates at dark during peak season. For those less inclined to follow a tiny ball around, the Fitness Center is open from 6:00 a.m. until 9:00 p.m. with yoga, nutrition, and fitness classes offered. Then cool off in their heated outdoor swimming pool. Eat lunch poolside or plan a private party between 11:00 a.m. and 8:00 p.m. from Memorial to Labor Day. Feeling decadent? Enjoy all the Club’s amenities by boat. Park your floating home-away-from-home at the Club dock and call ahead to have a delicious Terrace on the Green meal delivered fresh to port (or starboard) at your arrival. Prefer something light on those long summer nights? “We have the best Happy Hour in town in our Angela’s Martini Bar in the Legacy Building overlooking the Sound. It’s open from 3:00 p.m. to close daily with comfortable indoor seating, a cozy place to catch a game, as well as outdoor deck seating and cigar porch,” says Campbell. If 2018 is the year you say “I Do” (or start the endless planning and organization) consider the Club for your ideal outdoor wedding. Even though they are booked for every Saturday until the end of September with the exception of one in July where they had a wedding cancellation, and most Fridays are booked for club events, the Club has banquet facilities for up to 250 guests and a full staff of caterers, wedding and event planners, and more, ready to help you craft the perfect day. The best place to find detailed, up-to-date information on summer activities is via the Club’s website, event calendar, Facebook, or Instagram feeds. 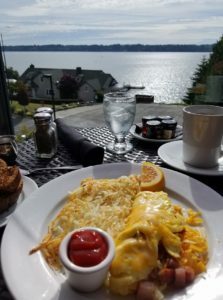 Reservation requests or questions about the Club can be directed to their main office at 360-866-7121 and ordering at the Terrace on the Green restaurant is via 360-350-0929. Breakfast, lunch, and dinner menus are available online. 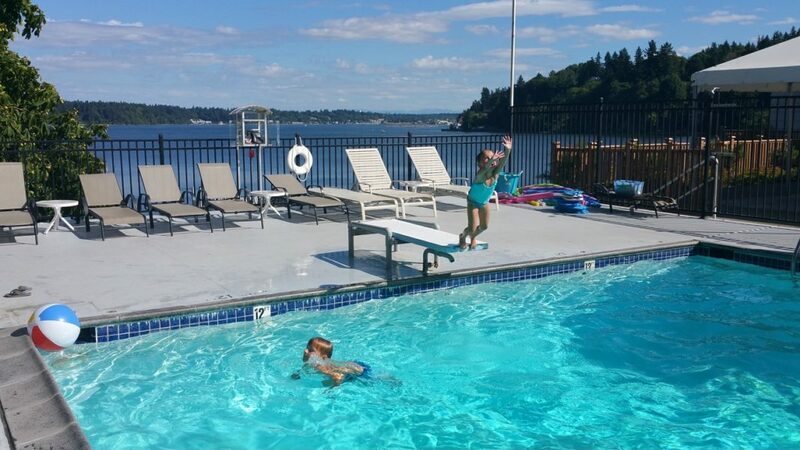 With a full season of activities for all ages, consider starting summertime traditions with your family at the Olympia Country and Golf Club.